Master Builders KwaZulu-Natal sponsored the clubhouse ceremony at the 2010 South Coast Construction Golf Day, which took place at the Port Shepstone Country Club on Friday the 23rd of July 2010. In terms of marketing the Association in that region, following on from the success of last year, in 2010 we took the decision to have our branding displayed in the club house rather than at one of the tees. The reasoning was simple, when sponsoring a tee although everybody does pass through; they are only exposed to the brand for a brief period of time when teeing off. They are also exposed to seventeen other brands along the way and considering the spirit (or variety of spirits) in which this particular event is played; brand retention isn’t a dead certainty. From a Master Builders KwaZulu-Natal perspective, this event is undoubtedly good for business as the who’s who of the construction industry in that particular region, all participate. To anyone who views the construction industry as their target market, sponsorship of this event is well worth considering for next year. We recently ran a news article covering the sterling work Stewcon Construction carried out on behalf of the people of Club Marina who had lost their homes when the Ifafa River flooded. The following is a letters of thanks from those whose lives were affected by the Stewcon Initiative. "Sometimes we take for granted the everyday things that happen around us, never stopping to think that maybe, just maybe this particular event is happening for a reason. Why? Because we are safe and snug in our own lives. Then the 17th June 2008 arrived and the Ifafa River showed us what power water has. It showed us that we must not take life for granted. The Ifafa River showed us that we were living in its path, and left us feeling insecure, undecided and unsafe. Then Club Marina Directors swopped our river sites for a site up on “ The Hill “ we now had a Dream. A Dream to have a home away from the wrath of the Ifafa, a dream to be safe, secure and snug once more. Wentzel we believe that you were sent to Club Marina to revamp Cindy`s home, and to become friends with the people of Club Marina. You never hesitated when you heard of our predicament, but loaded your Bakkie with spades,mops,clothes and wheelbarrows and delivered them to us. Then you came along and helped our dreams come true, you gave us affordable Quotes, brought Graham along with your working crew and started building our Dream up on “The Hill”. We, that chose to relocate Thank You Wentzel and Graham not forgetting Chappie who will replace Graham next year, for your Time, Knowledge and Patience that has been so generously spent building our Dreams. We enjoy your company and the odd cup of coffee together, but most of all, Wentzel, we believe that you, Wentzel were sent to Club Marina for a reason. Wentzel, without your Quotes, Time, Patience and Knowledge, many of us, who chose to relocate to higher ground on the Hill, would have had no option but live again in the Flood Line, feeling unsafe and insecure. So, we would like you to know that all that has been done for us is truly appreciated." In celebration of a community project’s conclusion, a handover ceremony took place on Thursday 22 July 2010 at the Nyandezulu Village west of Port Shepstone. The initiative was the second of its kind undertaken by a small group of business people consisting virtually entirely of Association members operating out of the KwaZulu-Natal South Coast region. Once again the recipient had been identified by Mayor Sithembiso Cele of Ugu Municipality who had initiated the project via George Enslin of Wakefields. George in turn got Hans Stols (South Coast Regional Manager) and Ray Basson (South Coast Regional Chairman) involved who got proceedings underway by contacting members of the Association requesting their participation. Reminiscent of the Gamalakhe Community Project undertaken in 2009, our South Coast members rose to the challenge and made a tangible difference in the life of somebody less fortunate than themselves. A detailed article covering the Nyandezulu initiative will soon be appearing on masterbuilders.co.za. Christmas in Zululand is a beautiful thing, not that I would know from personal experience, I do however assume it to be the case having witnessed the tremendous enthusiasm and vigor with which a box containing branded clothing was opened this morning. Our new range of branded clothing arrived last week and rather than couriering it to our Empangeni office, I brought it up myself as I already had a scheduled appointment with our Zululand Regional manager. While all recipients of the new branded clothing have displayed enthusiasm, none have with as much fervor as Balungile Nyawo aka Lungi. 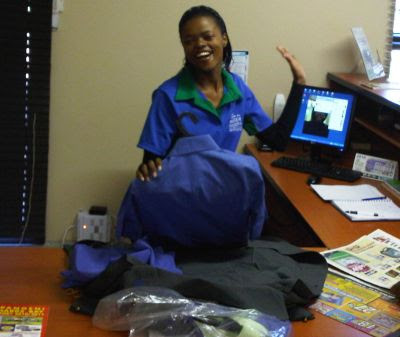 Balungile is our customer care assistant based at the Association’s Zululand office in Empangeni. She is extremely brand proud and her roles and responsibilities include client liaison as well as various administrative duties. Lungi is a great brand ambassador for the Association who now proudly boasts a range of vibrant branded clothing, to match her vibrant personality. I mentioned in an earlier post that Master Builders KwaZulu-Natal would as part of its greening initiative, be running a renewable parallel electricity supply. The use of solar and wind, supported by a number of technical applications form the basis of this project. 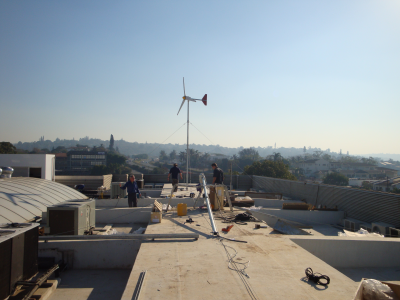 We are pleased to report that we are making progress and that the wind turbines are being mounted to the roof as I type. We will in the foreseeable future be providing an overview of the equipment we are running and how it impacts on the environment as well as providing a cost saving analysis. Our greening interventions are to be showcased as a source of information and inspiration to further and promote environmentally sustainable building practices. Renovations to our building continue and our green building exhibition centre will soon be open to the public. Parastatals are intended to be profitable organisations which exist to ease the tax burden, rather than to augment it. 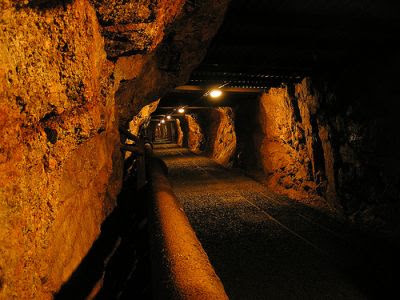 With respect to the ANC Youth League’s tireless efforts to keep the debate on nationalisation of our country’s mines alive, one wonders how many tax payers fear having to further subsidise losses, as apposed to having faith in government’s ability to run the mining industry profitably. Eskom’s ongoing shenanigans haven’t helped the cause and perhaps government accepts that they don’t need another headache. "Nationalisation of mines is not government policy. In my lifetime there will be no nationalisation of mines. Maybe when I'm dead, and rest assured I'm not dying next week," Minister Susan Shabangu, Department of Mineral Resources. On Thursday 22 July 2010 a community project handover ceremony is to take place at Nyandezulu on KwaZulu-Natal's South Coast. The Honourable Mayor and other delegates will be among the guests and will be handing over the keys to the project’s beneficiary. Once again reporters have been invited and editorials covering this very noble endeavour will feature in print media. 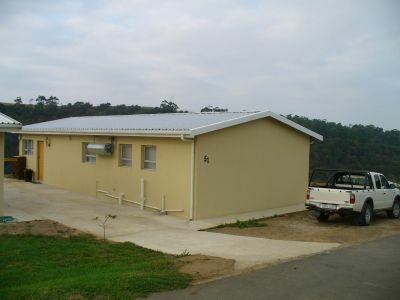 This is the second project of this nature that Master Builders KwaZulu-Natal South Coast members have collaborated on. Those who follow Association news will recall that in 2009 it was aimed at uplifting a particular family in the Gamalakhe township west of Port Shepstone. The Associations intrepid reporter (that would be me) will also be there notebook in one hand, camera in the other. The Gamalakhe handover was an incredibly gratifying experience and I look forward to being part of the Nyandezulu occasion. A warm-hearted thank you to all who contributed. Despite having recently uploaded a blog post titled “10 People Who Think you’re a Moron,” I recently received a chain mail of sorts from several of my colleagues who had hoped to receive a free Blackberry smartphone (within 24 hours) for their efforts. It is always a somewhat amusing contradiction, when the sender of chain letter is compelled to begin with: “I’m not superstitious but…” Who are they kidding! Next time you are sent a mail suggesting that you are to be rewarded in some or other way by forwarding it on to 10 or more people, I recommend you return the favour by sending them the infamous (which is to say, not famous) Anti-Chain Letter! Within one hour of receiving this letter, pass this letter on to absolutely nobody. Show your friends that you are really a true friend by not passing this letter on to them! If you don't pass the letter on within one hour, good fortune will come your way. If you don't pass the letter on within 24 hours, true love will come your way! If you never pass on this letter, you will find true love and you will be granted one wish! No lie! However, if you do pass on the Anti-Chain letter, "you will be cursed for eternity and you will not have any love in your life whatsoever. "…Well, not really, but you'll be cursed with the guilt of having passed on a self-defeating chain letter! So take that! It's your choice. True love, or guilt. . . Make The Right Decision. "I receive anti-chain letters all the time, but this time I decided, 'what the heck?' and instead of passing it on to all my friends, as I usually do, I decided to NOT pass on the anti-chain letter! Guess what happened? I won the lottery! This was really weird, especially because I had not actually bought a lottery ticket." 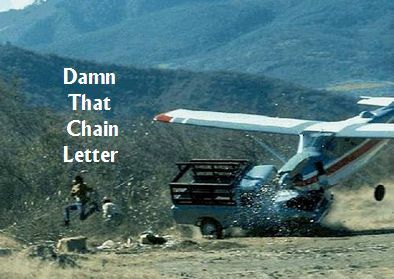 "I did not receive the anti-chain letter, but passed it on anyway. How I regret the day that I passed it on! Not only do I live with the guilt of passing it on - just as the letter predicted! - I also have utterly failed to find true love! 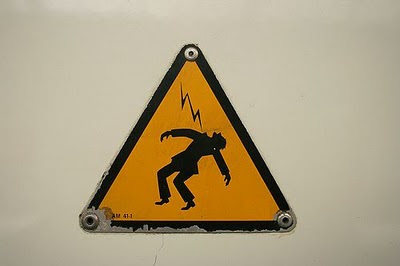 Also my grandmother, Edith, was struck by lightning soon afterward." "Ma tortue a pris fue et je n'ai pas de pantalon!" "I passed on the anti-chain letter, and my invasion of Russia failed." Pass it on at your Peril! I would like to draw your attention to two news commentaries, one appeared in Business Day, the other a Times Live article, both reporting on the findings of Mike Schussler, chief executive of Economists.co.za. He’s findings paint a somewhat bizarre picture and indicate that the unique economic circumstances that South African’s currently endure, aren’t sustainable. It is implied that the benefits enjoyed by those who work for parastatals, aren’t sustainable in the private sector. The standards which government and state enterprises have thus set, have resulted in private sector companies employing less, which in turn has resulted in more taking of social benefits. As you can no doubt imagine, there are a whole host of ramifications. According to Schussler more South Africans receive money from welfare, than from employment. His numbers inform that there are 12.8 million people working while 13.8 million receive welfare payments, this from the proceeds of five million taxpayers. He said this to express his view that the manner in which you display your brand directly reflects on how you operate as an organization. By removing magnetic strips from the vehicle after hours, the message is sent that there exists a 9 to 5 mindset. It also looks cheap and nasty creating the impression that whoever’s branding it displays, either operates on the cheap or does things halfheartedly. This particular gentleman believed it to be far more effective to vehicle wrap a car from top to bottom, thus telling the world that you are in it for the long ride. We re-launched our own brand just over a year ago and as organizations go we are extremely brand proud. After having placed a lot of thought into the design of it, we have just brought out our new range of branded clothing. With this in mind we got a bunch of good looking Hollywood model types to pose for a photograph, sporting our golf shirt range. Any family business that is harmoniously conducted with dedication and high professionalism has a recipe for success, but none more so than Longspan Gutters that has been providing the construction industry with worldclass products for the past three decades. From its inception, the vision of the company was to be seen as the industry market leader, renowned for its commitment to uncompromising quality and world-class service, and thus the company motto of We lead, others follow has been earned by the high skills levels exhibited throughout the company, the service provided to its customers, and the esteem with which Longspan Gutters is held throughout the industry. Longspan Gutters provides a comprehensive service for most configurations in the residential, commercial and industrial sectors by providing standard roll-formed gutters on site. Purpose made gutters, fascia and barge board replacements, purpose made cladding and flashings are an additional service which Longspan Gutters engages in, and are fitted on site to the correct dimensions and specifications. This provides considerable savings in time, labour and materials because the purpose made gutters, fascia and barge board replacements, purpose made cladding and flashings are all formed and fitted on site to the correct dimensions and specifications. The precision installation process is fast, efficient and hassle-free, and the seamless gutters are guaranteed not to fade, leak or rust. The aluminum coating formulation has been selected to provide optimum qualities of film hardness, flexibility for forming operations, light fastness and resistance to weathering and chalking. 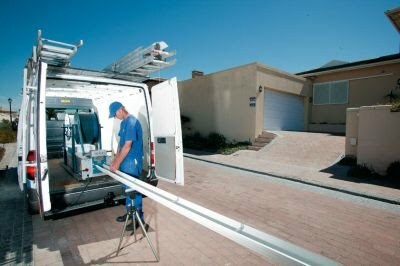 Longspan Gutters has gained an enviable reputation for its highly skilled staff in all aspects of its business. Company administration, sales, manufacturing and on-site forming and installation are all carried out by staff with a high level of skill and experience, and this in turn generates a feeling of pride in the company, endorsed by the extremely high rate of staff retention the company enjoys. Most employees have been with the company for over a decade and bring a high level of expertise and dedication to any project they undertake. 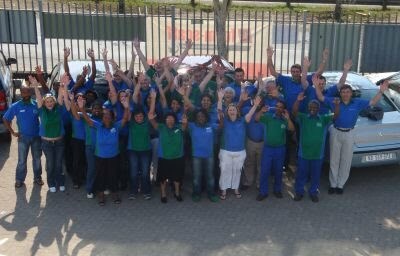 Also, Longspan Gutters has a strong sense of social responsibility, having been awarded the Best SMME of the Year as a Proudly South African Company, and its factories (in Cape Town and Durban) have attained verified BBBEE status under the terms of the Broad-Based Black Empowerment Act 53/2003. I doubt that Eskom employees were by any stretch of the imagination, the worst paid lot in town to begin with. Regardless of how a parastatal performs financially, it has to scrupulously follow every corporate governance guideline perhaps encouraging an environment in which annual increases are considered a right, rather than something that is worked for and earned. Eskom is now offering workers a 9% wage increase along with a R1500 housing allowance, as apposed to the previous offer of a R1000 housing allowance and an 8.5 % increase. 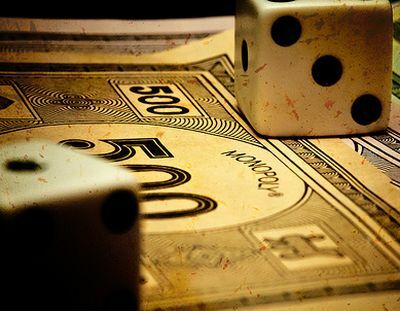 When one considers the current economic climate, and the degree to which the consumer is expected to bale the mismanaged Public Utility out, how appalling is it that they used the World Cup and the reputation of our country, as leverage for the sake of .5 of a percent. The ANC believes that the deal illustrates that all the parties involved are unquestionably patriotic and supportive to South Africa’s current hosting of the 2010 FIFA World Cup. To me it read more like underperforming ungrateful cretins hold SA to ransom. But perhaps I have missed something, if so please let me know by posting a comment. Eskom is truly a unique organization which differentiates itself by taking conventional business wisdom and implementing entirely the opposite. If there were a book titled “Best Business Practice for Dummies”, it would no doubt clearly state that rule 1 of surviving difficult times is to cut back on unnecessary expenses and not to reward those who under perform. In addition to the ongoing wage dispute and unions threatening to strike, the Public Utility has again made headlines this time for indulging in World Cup festivity at the expense of the consumer. Let’s not forget that it was Eskom's dire financial footing, which led to a R27-billion World Bank loan in order to maintain the country’s electricity supply. It also resulted in the already battle weary consumer having to face the daunting prospect of subsidising it by way of large tariff hikes. It is for this reason I am angered by news that during 2009 and 2010, Eskom purchased 1 110 World Cup tickets 700 of which were for hospitality seating valued at about R17 000 each. 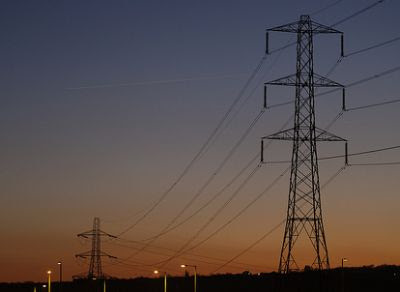 It has emerged that the decision to make the purchase which amounted to R12.6 million, was in fact taken in November 2008 four months prior to a financial year end that saw Eskom declare a R9.7-billion loss. I cannot help wondering how many electricity consumers would dearly liked to have attended at least one World Cup game but simply couldn’t find room in their respective budgets for it. The same principle applies to households as with business, in difficult times you cut back on luxuries. The self indulgent behavior of Eskom’s hierarchy is deplorable.